The second volume in the trilogy that revisions Homer’s Odyssey is once again told from the viewpoint of Alexi, the young Trojan boy. Captured by Odysseus after the fall of Troy, Alexi is forced to accompany the Greeks on their sea journey home to Ithaca. 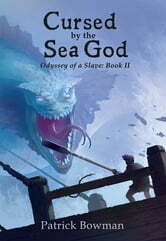 Cursed by the Sea God contains many of the iconic adventures of the homeward journey, including the encounter with the keeper of the winds, the descent into Hades, the fateful visit to the cannibal Laestrygonians, the encounters with Circe the sorceress, the songs of the Sirens, and the deadly passage between the monster Scylla and the whirlpool Charybdis. Having earned his master’s respect in saving him from the Sirens, Alexi loses it all though mischance, and his own circumstances take a turn for the worse as he is given away to the most brutal soldier on the ship. It takes all of Alexi’s skill and determination just to stay alive. The first volume in the trilogy, Torn from Troy, was nominated for the 2012 OLA Red Maple Award and has proved to be a best seller.